According to the 2015 Content Preferences Survey, 91 percent of buyers prefer visual and interactive content rather than traditional formats. Making your website interactive gives you ample opportunities to improve the overall customer experience and increase the conversion rate of your online store. Here are 7 ways in which you can make your e-commerce website more interactive. When you visit a retail outlet, you are usually greeted by a sales assistant. They help you make an informed decision by helping you through the buyer’s journey. You can achieve the same in the virtual environment through live chat. Live chat allows you to assist your shoppers in real time, unlike email support. You can solve any queries they may have, find upsell and cross-sell opportunities and make their shopping experience more convenient. This can bring down the cart abandonment rate and positively impact the brand loyalty. This can also help in improving your content strategy as well. By analyzing the queries, you can create content around topics that are either frequently asked questions or queries that can be easily solved. You can take the next step by harnessing the power of artificial intelligence. You can integrate a chatbot on your website that is available 24*7 to help your buyers. The machine learning capability of chatbot will make it smarter with each interaction. This will significantly offload the tasks from your customer service reps to the chatbot. Gamification is a marketing technique that strives to appeal to the reward-seeking mechanism present in the human brain. The human brain releases a chemical called dopamine everytime a favorable activity happens, inciting us to pursue those activities over and over again. Gamification is based on the same principle. 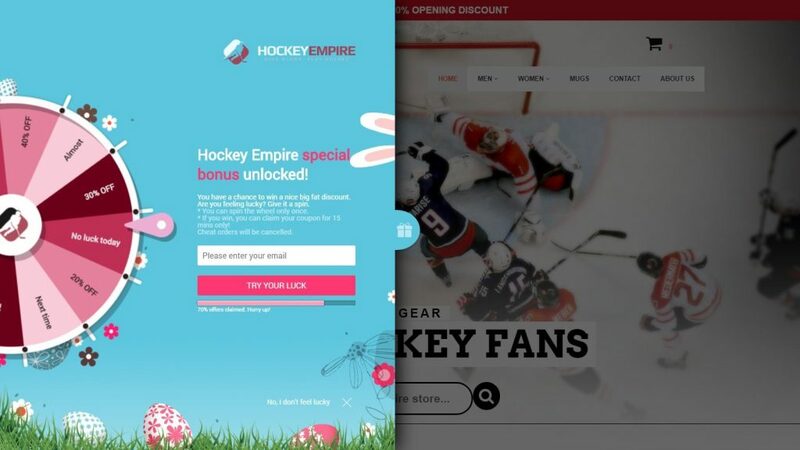 Introducing reward points to increase brand loyalty is one of the simplest ways to introduce gamification in your e-commerce marketing strategy. Another tactic that is gaining prominence is using spinner wheel with the exit intent logic. Users can type in their email address, spin the wheel and get a coupon code or any similar reward which they can avail during checkout. The anticipation of winning something keeps the users glued to the app making the user experience more interactive. User-generated content is one of the fastest ways to establish yourself as an authentic brand. When your customers proudly showcase your products on social media avenues, it’s a great sign for your brand. 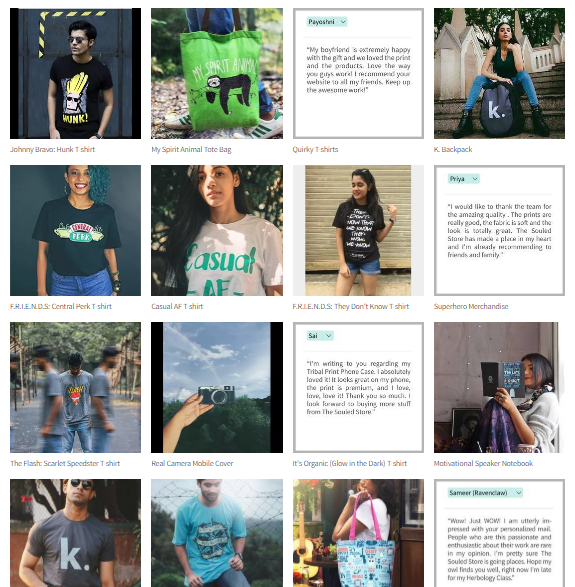 User-generated content such as photos and videos are useful not only as a form of content but more importantly, they play a crucial role in influencing the purchase decision. You can encourage your shoppers to leave reviews and ratings under the product pages or ask for customer testimonials if you sell niche products. Run a social media campaign where people can post their photos on Twitter or Instagram with specific hashtags. 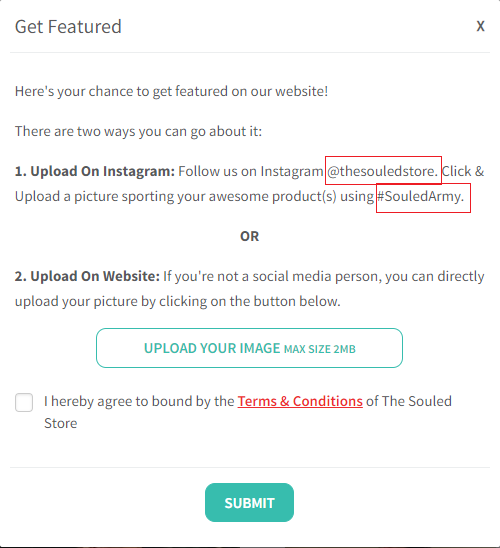 You can aggregate the content under that hashtag and post it on your website. The Souled Store does a really great job at this. Website: You can use a service like Qualaroo to run polls and surveys. The modern customer feedback apps are capable of targeting users based on their behavior, actions, cookies, location, identity, etc. Social Media: Social media platforms such as Facebook, Twitter, and Instagram allow you to run polls. You can use this feature to solicit customer feedback or engage them through witty posts. Emails: To understand the quality of your product and service, you can send an email to asking about the same. You can also encourage them to rate and review the product. Shoppable content is any form of content that gives users the direct opportunity to buy a product within a few clicks. The simplest activity any user can perform on a webpage is to click on a web element. It could be a text, image, video, call-to-action, etc. By strategically placing shoppable content on your website, you will be able to increase the conversion rate of your website. A great place to start is focusing on the fundamental elements of a product page. Make sure that the headline, body copy, call-to-actions, product images, etc. are correctly placed. Walmart has innovated on the concept of shoppable content by displaying shoppable photos. When you visit the Home, Furniture & Appliances category on their website, you can choose the option of Shop by Room where you can see a specimen with clickable items. Upon clicking on any of the items, you can see a pane sliding in from the right which allows you to add the item in the cart right away. One of the shortcomings of shopping online is intangibility. You can’t try the product before making the purchase. And in the age of personalization, you need to offer a way in which your users will get an experience of the product. Product builders help you do that! In the age of interactive marketing, product builders allow shoppers to customize their products. For example, Autonomy Guitars allow its buyers to customize their guitars according to their liking. They can choose the model, wood, colors, pickups etc. and get it built. You don’t have to remain restricted to your website exclusively to make the shopping experience interactive. With the rise of social commerce, you can move to social media platforms as well to sell your products. With the rise of Instagram Shoppable, it has become easy to sell via Instagram. If you have an Instagram Business account and are based out of America, Canada, the UK, Brazil, Italy, Germany, France, or Australia, you will be able to sell your products through Instagram. Here is an example of Wampler Pedals using Instagram Shoppable to drive traffic to their website. Making the shopping experience of your online store interactive will increase the average time a user spends on your website, skyrocket the conversion rate and improve brand loyalty. If you are just getting started, you don’t have to go overboard by picking multiple examples at once. Start the simplest one and build from there. Let us know which idea will you implement first! The editorial staff takes care of growth strategies, content creation, and outreach within the community for HumCommerce. WooCommerce or Shopify to build an e-commerce website? Copyright © 2019 HumCommerce. All Rights Reserved.